Our Kulinarya challenge for February is to create a dish that recalls your first love... plus a good love story to go with it. I fell off my chair laughing when I read the email sent by this month's hosts: Abigail of Nappytales and Marni of Kensington Kitchen, because I think being with the same man for more than a quarter of a century makes me feel too old to remember. I am choosing to share with you my Fruit Compote, which may not sound perfect for a Filipino cooking club, but I have a good alibi for it. You see I've shared a lot of dishes like lengua in my post Reminiscing, and Chicken ala Max's in my post The house that fried chicken built. I also wrote posts like He Still Gives me Flowers and I Crepe the Promise, wherein I shared the iced tea I used to serve him and the dessert of mango crepes we loved during our early dates. So since Valentine's just passed, I want to share with you our V-day dessert. Although we didn't expect anything from each other that day, I was still surprised that he came home with flowers and wine while I surprised him with a special dinner for two with all the trimmings. 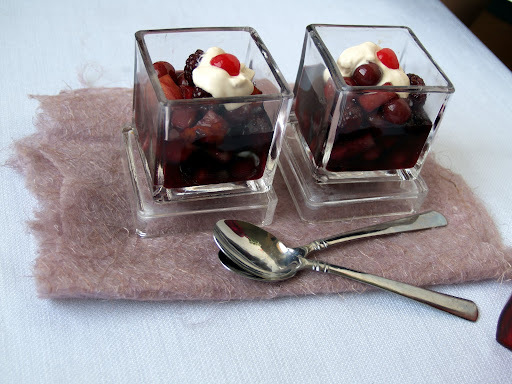 The dessert that stole the night was the Fruit Compote, which was inspired by Jacques Pepin. We both agreed this reminds us of our traditional Filipino fruit salad but the only difference is this seems to be a fruit salad on steroids. 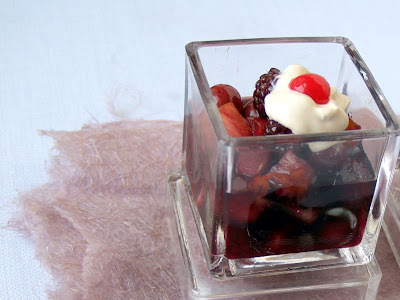 Our Filipino version uses canned fruits while this recipe is made of fresh fruits stewed in red wine with the cream added on top. We both loved the tartness that is balanced by the sweetness we got at the end (both from the cream and the syrup). And we both smiled that just like this dessert, most relationships can be sour sometimes but oftentimes sweet. Here is the original recipe of Red Fruit Compote. But my version listed below is a simplified one. Boil water in a small pot and dissolve the sugar. Allow the mixture to thicken. Pour the red wine. Mix the syrup thoroughly. Add the fruit slices (with the hard fruits first then followed by the grapes and blueberry). Let it cool and serve chilled. Scoop it in a serving cup and dollop or top it with heavy cream and a cherry. Wow... quarter of a century hah! Ryan & I have been together for 18 yrs. I guess relationships just get better and better when you're with the right person! Your fruit compote looks amazing, Malou! You know how much Filipinos love dessert, so this is just perfect for KCC! I LOVE LOVE LOVE Jacques Pepin. I would cook nothing but his recipes if I didn't find so many other things that catch my attention. Julia and Jacques are my inspiration. No nonsense people. This is a beautiful and pretty looking dessert. I love all of the ingredients and think this would be quite refreshing after a heavy meal. looks awesome and seems easy enough to make. i'm sure you had a lovely v day dinner as it was spent with your loved one! thanks for sharing. I love the beautiful and delicious dessert. It's perfect for Valentine's Day. 25 Years! That was me in 2011. Isn't it grand? And Jacques Pepin's recipes are the loveliest - fit for a celebration of just an "I love you dinner." So pretty. SO tasty. They look perfect and I bet YUM, too. Happy V-day to both of you! 25 years... wow! Perfect for Valentine's, a celebration of love and a cold winter's day! I love it. 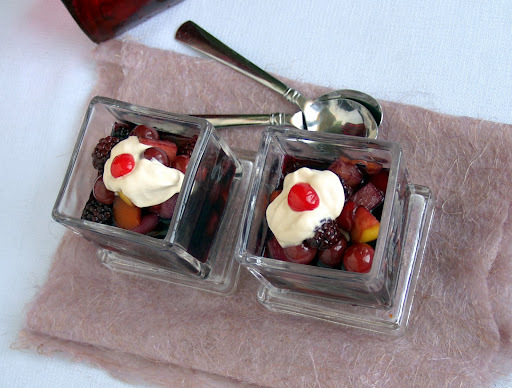 Your Fruit Compote ala Jacques Pepin looks delicious. 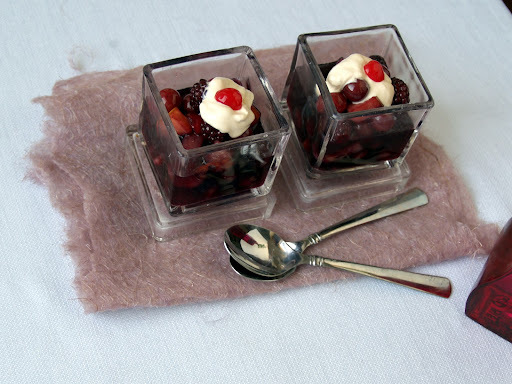 I like the use of Blackberries. what a nice refreshing dessert to serve on Valentine's. The flavors sound nice together. I can relate on being married for a while 22 years this year for us :)thanks for stopping by my blog and leaving a nice comment. I can totally feel the love in your KCC entry! We have a long way to go (5 years pa lang). This is such a yummy dessert in replace of our traditional fruit salad. Never really knew we can make compote with different fruits all at the same time! Now I can't wait to try making it. and as always any food when served with love and shared with your best half..perfect! 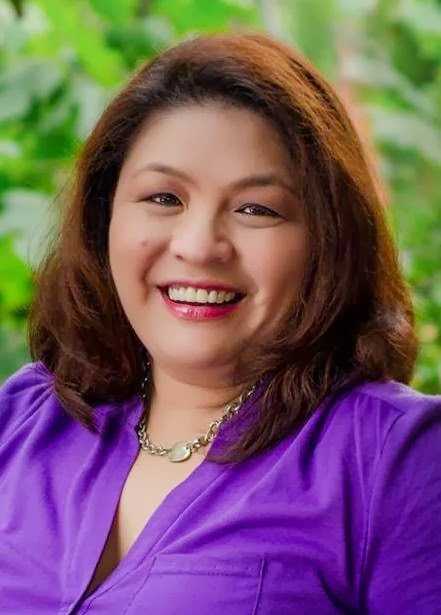 Thanks for sharing this nice Kulinarya entry, Malou! It's a beauty!